Credits get this off to an interesting start, with two directors cited, one for dialogue, the other for "screen direction." This wasn't uncommon for early talkers, there being doubt in some quarters that old-timers who herded silent emoters were equal to task of ramrodding word exchange. Distinguished meggers were thought to be washed out by coming of sound, not a few careers headed for scrap thanks to industry shake-up. Fit To Be Tied was Paramount detouring of Burns and Allen to Astoria from vaudeville stages where the team's trade was ordinarily plied, their movie experience to 1930 being a single reel for Vitaphone (Lamb Chops) and nothing else. This then, was audition as much as anything for screen work to come, and must have been a click, as B&A kept mirthing for Paramount in both shorts, and eventually, features, for nearly a decade more. Fit To Be Tied George seeks neckwear in a department store among staff that's either indifferent or plain nutty. The latter is where Gracie comes in, but first there's Burns trying to get a word into slangy edgewise between billed-as "talkative salesgirl" June Clayworth and unnamed assist. Theirs is actually a funniest segment in the reel, being fast-spoke glossary of 20's catch-phrasing that I'd remember and utilize but for speed and plenty of it (Listen, big boy, if you're going to talk to me in that varicose vein, I'll leave you flatter than a puncture). The George/Gracie exchange looks transposed from their vaude act --- why write specific for a camera standing in for front row sitters? The only thing missing was an audience, that, of course, being crucial, and a disadvantage all these performers labored under when they put acts to film. Fit To Be Tied is included among Kino's DVD Cavalcade Of Comedy. If this is a screen grab it looks like it was filmed through gauze. Maybe glsss in front of the camera in a sound proofed box or maybe that is the quality of what survives. Worth checking out though. Thanks. as part of a KINO disc of comedy shorts. Not sure of the album name. 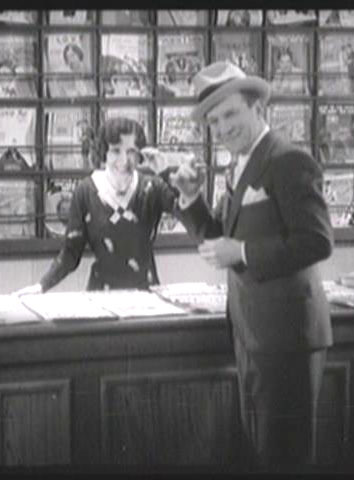 Some of the dialogue is VERY pre-code--especially the phone conversation of one of the female clerks George Burns sees first. Love the shout out for the supporting cast. The missing audience is a bit of a drawback, but not much. Love how B&A 'look' for the audience in the beginning of LAMB CHOPS. That first short is, to me, the very definition of charm. Showed it cold to an group of about 90 some years back and the place went wild.